Giallo films, you either love them or hate them, personally I have always loved them. There's no denying the talents of the film's Director Dario Argento, a legendary name in the genre and it's because of films such as "Opera" that cement that legacy for him. This was made during his peak period and it's still as great today. The casting is great, even though Argento has stated that Cristina Marsillach was the most difficult actress he has ever worked with. Plus the cinematography is so stunning that it's like watching an art piece come to life and it never ceases to amaze me. The film features an infamous scene, you know the one I mean, and as someone who gets squeamish when it comes to eyeballs it has made me wriggle in my seat every single time I see it and it nevers waned. Apparently the idea of the pins-under-the-eyes came from a joke, Argento said it would annoy him when people would look away during the scary scenes so he jokingly suggested taping pins under people's eyes so they couldn't look away from the film. 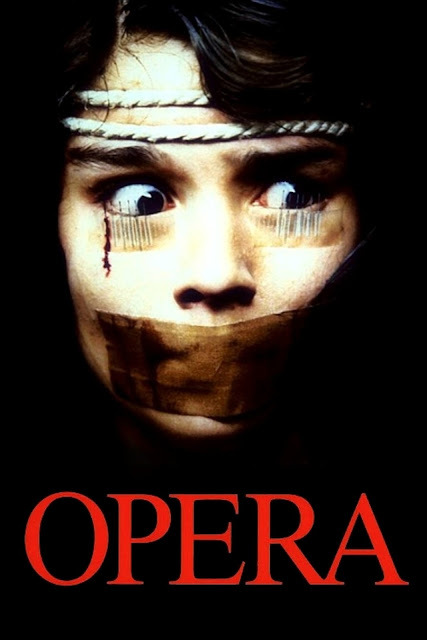 "Opera" is not for everyone but if you haven't had the pleasure of viewing Argento's work yet it's a great place to start. According to star Urbano Barberini, it would take hours for everyone to re-capture the crows after they were released in the opera house for filming. Around 140 crows were used, but only 60 sum were ever retrieved. The others apparently escaped from the opera house during filming. Orion, the American distributor of the film, wanted Argento to cut the final scenes in the Swiss countryside out of the film. Argento refused. The last theatrical film of Ian Charleson. Vanessa Redgrave was attached to appear as Mara Czekova, but dropped out shortly before production began. The role was then reduced to a minor one. Many mishaps on set, including the death of one of the actors, led director Dario Argento to believe that the "Macbeth curse" also struck during the making of this film. The character of Marco, the horror director turned opera director, was based on Dario Argento himself. Originally, Columbia Pictures intended to release the film theatrically in Germany in 1988 but after the FSK (Official German Censorship) demanded to cut out almost 25 minutes, mostly violence (among others the two scenes with Betty wearing the needles), it was released straight to VHS, even though a theatrical release has already been announced. During the filming, Ian Charleson got into a minor car accident and was hospitalized for a week where, after having some medical tests done, he was diagnosed being HIV-positive, a condition which he had suspected himself to be for nearly a year prior to filming. There has frequently been controversy about the film's aspect ratio since it was shot in the Super 35 process and released both in 2,35:1 and 1,85:1 on DVD with the general conclusion being that 2,35:1 was the ratio intended by Dario Argento since he had the film shown that way on various festivals and obviously chose to use Super 35 himself for this film. Daria Nicolodi originally did not want to play the role of Mira. She felt the character was thinly-written and in addition had ended her long-time relationship with Dario Argento two years earlier. What finally convinced her to take the role was the fact that she loved Mira's elaborate and shocking death scene. She would later say that filming her death scene was tremendously scary as it required her to have a small amount of explosive placed on the back of her head. The film had an alternate ending at one point where after Marco was killed, Betty would realize she was sadistically in love with the killer. The two would then flee together into the Swiss countryside and the film would end.